Court briefs: Who's been up in court? 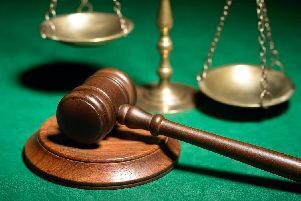 Here are the latest Calderdale cases to appear in magistrates court. Nick Fennelly (42) of Moor End Road, Pellon, given 3 points on his license, £220 fine, £30 victim surcharge, £85 costs for speeding. David Green (22) of Hunter Hill Road, Mixenden, given 6 points on his license, £440 fine, £30 victim surcharge, £85 costs for driving without due care and attention used a vehicle which no test certificate had been issued within the appropriate period. Mohammed Qasim Khan (30) of Ridgeway, Queensbury, given 3 points on his license, £220 fine, £30 victim surcharge, £85 costs for speeding. James Sanderson (52) of Scarborough Terrace, Elland, given 6 points on his license, £660 fine, £66 victim surcharge, £85 costs for failing to give information relating to the identification of a driver. Micaela Gonzales-Monana (40) of Chapel Lane, Sowerby Bridge, given 3 points on her license, £60 fine, £30 victim surcharge, £85 costs for speeding. Gary Sayle (30) of Furness Drive, Illingworth, given 8 points on his license, £230 fine, £30 victim surcharge, £85 costs for driving without insurance. Jiri Matuska (56) of Blackwood Grove, Halifax, given 3 points on his license, £40 fine, £30 victim surcharge, £85 costs for speeding. Hassnain Shahid (25) of Eversley Mount, Halifax, £100 fine, £30 victim surcharge for having a vehicle registration plate that failed to comply with regulations. Ashley Halliday (21) of Ogden View Close, Halifax, given 5 points on his license, £440 fine, £44 victim surcharge, £85 costs for speeding. Aqib Javaid (19) of Highroad Well Lane, Halifax, given 8 points on his license, £770 fine, £77 victim surcharge, £85 costs for driving without insurance and using a mobile phone when driving. Liam Daniel Lalu (26) of Holly Bank Road, Brighouse, £330 fine, £33 victim surcharge, £85 costs for vehicle lamps which did not meet regulations and a for having a vehicle registration plate that was not easily distinguishable. Mohammed Junaid Khan (27) of Pellon Lane, Halifax, given 8 points on his license, £660 fine, £66 victim surcharge, £85 costs, for driving without insurance. Sophie Steele (36) of West View, Halifax, given 8 points on her license, £660 fine £66 victim surcharge, £85 costs for driving without insurance. Ghazala Tabassum (43) of Savile Park Road, Halifax, given 6 points on her license, £660 fine, £66 victim surcharge, £85 costs for failing to give information relating to the identification of a driver. Stuart Anthony Wardle (29) of Cedar Street, Halifax, £40 fine, £200 compensation, £30 victim surcharge, £85 costs for criminal damage. Kasim Ali (27) of Badger Wood, Todmorden, given 6 points on his license, £120 fine, £30 victim surcharge, £85 costs for speeding.